Until last night's Nintendo 3DS Conference 2011, I was bound and determined to hold off on buying a 3DS until Kyoto-based company released a DS Lite-esque redesign. 1. 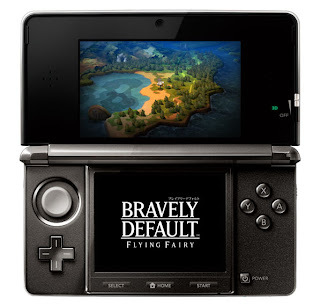 Bravely Default: Flying Fairy--Yes, the title of this Square Enix game is absurd. Who cares, though, when it looks so amazing? (Go here to check out a few screenshots and a pair of trailers of the game.) Really, it seems this game could (should?) have been called Final Fantasy: The 4 Heroes of Light 2--which means I'm going to be on it like white on rice. 2. A new Fire Emblem--I have to admit, it's been a long time since I've played a Fire Emblem title. That didn't stop me from cheering when this game was mentioned during last night's conference, though. Both the battle and overworld graphics--highlighted in the title's "debut trailer"--look pretty darn great, don't you think? 3. A Girls Mode (aka Style Savvy) sequel--I've yet to play Nintendo's fashion-focused DS title, Style Savvy, but I've read enough positive reviews of it to know that it's worth checking out regardless of your gender or sexual orientation. As such, I'm very much hoping this sequel follows in its predecessor's footsteps and makes its way to North America sooner rather than later. 4. Mario Tennis--Along with Fire Emblem, this game was the surprise of the Nintendo 3DS Conference 2011 for me. After overlooking the Mario Tennis series during the DS and Wii "eras," I thought Nintendo had given up on it. Although I hope this installment includes an RPG-ish mode just like the series' previous portable iterations, I'll buy it even if it doesn't. Three additional titles that could push me to buy a 3DS before the inevitable redesign: Animal Crossing, Luigi's Mansion 2 and Paper Mario, all of which will be released in (early?) 2012. For more information on the accessories, games and systems that were announced and/or discussed during last night's Nintendo 3DS Conference 2011, check out andriasang.com's coverage of the event here. It's a really exciting time for the 3DS, though! It's finally shaping up to be a handheld console that's truly worth owning. I'm psyched! As long as all these cool games get localized, I'll be more than happy. Which announcements were you most excited by, by the way? Or were you excited about all of them? I'm a bit worried about the localization prospects of Bravely Default and Girls Mode/Style Savvy, by the way. Hopefully I'm wrong and both will make it out of Japan eventually! All of the announcements were interesting to me, but I'm really hyped for Bravely Default! Since I loved 4 Heroes of Light and all. Fire Emblem also looked great, and I might finally get into Monster Hunter now! Style Savvy for DS seemed to get a positive reception in the West, so I'm hoping this will mean we'll see it out here, too! It'd also be nice if the pink 3DS came out stateside, since my fiancee now wants it and the region-locking would prevent imports... Though we got other pink DSes out here, so again, hopeful! Oh, I'm glad to hear you're interested in Bravely Default. What a gorgeous looking game! I'd like to say I have hope that the Friend Collection/Tomodachi Collection sequel will be released here, but you know it won't. Dammit. 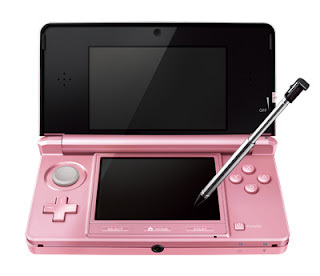 As for the pink 3DS, I have a feeling it'll be out here before Christmas. I'm sure NoA wants to get more 3DSes in the hands of Americans, too, and this seems like a good way of making that happen. I'm still waiting til Next July to get one so the library builds up. But I indeed do want one. I'm interested in a few titles like the new shinobi game, some mario titles, the devil survivor redux and such. I like that you have a specific month in mind, Motherplayer! Why have you settled on July, BTW, if you don't mind me asking? Speaking of July, I think a great number of must-have games will be out by then, so you'll surely have a number to choose from, including the ones you already mentioned. The only thing I really want to see more of at this point are more RPGs. OK, and some more original/unique (i.e., non-sequels) titles, too. Man I had a 3DS. Then I lost it. At an airport. Most annoying thing is that the ambassador program was due out in like, days. Furthermore, I had like three years worth of photos on it. And all of that transferred downloaded content from my old DSi. And the system was in Japanese! It's of no use to the person who found it! Why wouldn't they just hand that into the lost and found? What jerks. Sorry I'm just ranting but it's a real shame, seeming as the library and features of the system really are just getting better and better. Oh, that's terrible. Sorry, SUIKA :( Are planning to replace it at some point, or was the situation enough to kill your interest in the system altogether? Is it bad that I'm sort of dreading the new Animal Crossing game because it's going to eat my life? Oh, man, Simon -- you *really* need to get a DS at some point. One of the best-ever portables, IMO -- if not *the* best ever. Really! Actually, if you can get a DS Lite, DSi or DSi XL really cheap, that may be the way to go for you, as I've heard some complaints regarding how the 3DS deals with/upscales regular DS games. If those complaints have merit (I sadly don't know), you may be better off playing DS games on the original hardware. Oh, and I'm with you RE: F-Zero games on the 3DS! It's a must, IMO. After passing the series over during the DS and Wii eras, I have a feeling Nintendo will come back to it during the 3DS era, BTW. Fingers crossed! No, Justin, it's not bad at all. I'm both dreading and excited about it too. I'm glad this version will be portable again, though. The Wii version drove me nuts because I couldn't take it with me when we went home for Christmas, etc. Also, I constantly had to bug my husband to use the TV (as in, "But David, there's an event tonight and I CAN'T miss it!"). Yup. And we love it.